1.Water purification: GL-RO adopts membrane technology in filter to clear the bacteria, viruses, organic matter, heavy-metal, chloroform and other carcinogen. At the same time, GL-RO retains the trace element beneficial for health and the water quality reaches the standard GB17324-1998. The water can be assured to drink. 2.Never scaling: membrane technology assures to clear the thermonatrite, totally cure the scale so that increases of service life and could be maintenance-free. Pipe instant heating could make the water boiling at once when the water come into the pipe. Connect the power when the water inflow into the hot pipe, Cut off the power when no water inflow in. 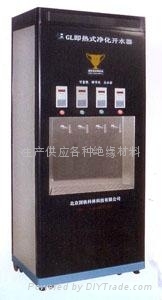 The thermal efficiency could reach 97% while common water boiler just could reach 50%. Instant heating could keep fresh of the water and avoid to produce nitrite and other Carcinogens when repeatedly boiling. 4. Card charging: According to customers’ need, card is available. Different price for cool and hot water . 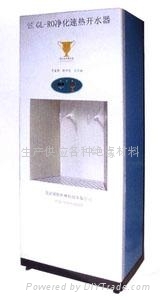 5.Intelligence control: water and electricity separation; triple leakage protection, Computer intelligence control to assure steady operation and convenient maintainance. 6.Zero release: Our patent technology could fulfill zero release and no waste water. 7.Water-purifying: Besides supplying hot water, GL-RO could produce 30 barrels(18kg per barrel) of pure water that could be used to ordinary water dispenser. 8.Intelligent Detection: GL-RO has the function of detecting the water quality and showing the water temperature. TDS(water quality)<70, temperature of hot water = 95±3℃.GL-RO could supply cool water, warm water and boiling water at one time. Users could choose the function with your need. GL-RO pure water purifier is the perfect and top product specialized on purifying water, clearing the scale and transient heating. It is new health, less carbon and environmental water equipment with independent intellectual property rights and six special techniques. GL-RO is the only water equipment which could realize transient heating in pipe without hot water tank.